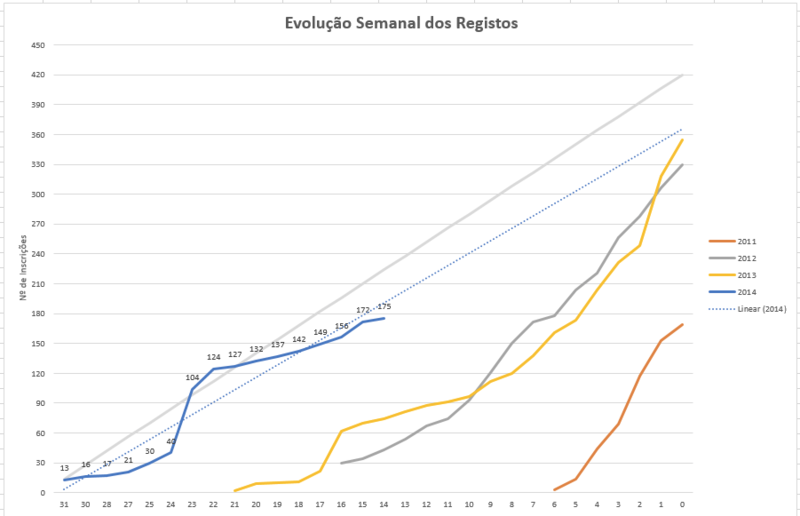 Here is one of the most awesome things that we (SQLSaturday Portugal organizers) have – a small analytical system for tracking our progress with the registrations for our upcoming event. I wish I could tell that it was me, who developed it, but it was Paulo Matos who created it. You will see the build up of attendees for each of our previous SQLSaturdays, as well as the current one (yes, we really have 176 registration now as I write this). You will see the direct line of our hopes and expectations to reach around 400 registrations, as well as the linear projections of where we are actually going right now. Inside this archive you will find 4 files with stub registrations, that we are extracting from the SQLSaturday administration site (and which every organizer can actually do), and that we integrate together using the awesome Power Query. First, you will need to setup drive S on your system, for that there is a small batch file inside the archive. Then, you will need the latest build of Power Query from December 2013 in order to make it work. After that feel free to use your own data in order to track the progress of your SQLSaturday registrations. Please, let us know if you are using it or you have suggestions on how to improve it.